Just 76 days after Arsenal beat Aston Villa to lift the FA Cup trophy, the tournament begins again. It might be November before Football League clubs join the illustrious competition, but 368 non-league teams will take their first step on the long road to Wembley this weekend. From a team named after a chocolate company to a former Premier League winner, there are plenty of sides and players dreaming of cup glory. BBC Sport takes a look at some of the stories from the extra preliminary round. Sweet smell of success for Cadbury? For one team that has never progressed beyond the extra preliminary round, victory this weekend would be extra sweet. Cadbury Athletic, named after the famous confectionery company, are back in the FA Cup for only the third time in their 21-year history. It is not just the name that links the two, with the Chocolate Men - the club's nickname - playing in purple and having the company's logo on their kits. The club's original pitch is on the grounds of Cadbury's Birmingham factory and is so close, in fact, that is not uncommon for the smell of chocolate to waft over, as one famous former player remembers experiencing. "You could smell the chocolate when you played," Liverpool striker Daniel Sturridge, who played for Cadbury when he was six, said in 2013. "Unfortunately, though, we didn't get any freebies." Sturridge scored 50 goals in one season while playing for Athletic's junior sides before catching the eye of Aston Villa. "He was a very level-headed young lad," Cadbury Athletic chairman John Peckham said. "He always listened and his attitude was excellent, while on the pitch his pace and ball control made him stand out." Sturridge is not the only professional player to have got his first taste of football at Cadbury, with Birmingham City's highly rated winger Demarai Gray, now 19, also starting out at the Bournville club. But it is not only for sweet-smelling air and the prospect of spotting a talented youngster that Villa and Blues have taken an interest in Cadbury Athletic in the past. The Cadbury Recreation Ground boasts some of the most hallowed turf in English football, with the grass used on the pitch the same that was laid at the old Wembley. "The ground is a bit of an icon," added Peckham. "There are four clubs in the UK and Ireland which have what is called Northumberland turf, which is Wembley turf. "Aston Villa used to go and train there when they got to the FA Cup final. In fact, I think the one time they did not train there was ahead of this year's final - the time they lost." Not many clubs competing in the very first stage of this year's FA Cup will be able to call upon the expertise of a Premier League winner, but Lancashire side AFC Darwen can. Former Scotland international Kevin Gallacher, who was part of the title-winning Blackburn side in 1995, is the North West Counties League Premier Division side's director of football. Having spent his playing career in the professional game, coaching amateurs from a market town whose entire population could fit inside Blackburn's 31,000-capacity Ewood Park has certainly been something of a culture shock for the 48 year old. "Amateurs are working guys. They have to work for eight hours a day and then come and train and so there is a different mentality," he said. "I'd rather coach professionals than amateurs, put it that way." One of the difficulties Gallacher faces is trying to keep hold of the club's best players, with even the offer of £5 extra at a rival club enough to turn heads. But, along with the rest of the club's management team, Gallacher contributed to their successful season last year, as they were promoted from the North West Counties League First Division. That means they are able to compete in the FA Cup for the first time since they were formed in 2009 as the successor to Darwen FC, who ran into financial difficulties and were wound up. Darwen FC - AFC Darwen's predecessor - created FA Cup history by fielding what were believed to be the first professional footballers in English football. In 1879, they signed Fergie Suter and James Love from Scottish side Partick Thistle, with the pair being paid a wage. Darwen FC had an illustrious history in the FA Cup, reaching the semi-finals in 1881 after beating Romford 15-0 in the quarter-finals. Everyone associated with the club will be hoping to bring the good times in the FA Cup back to Darwen, especially Gallacher, who did not enjoy many highs in the competition as a player. "I never had magical moments in it," he said. "When I was at Newcastle we got to the semi-final and in the final training session before the game we were practising penalties and I injured myself, ruling me out of the semi. "I never seemed to do really well in the FA Cup." Shaking off the pre-season rustiness and shedding a few holiday pounds is a task perhaps all too familiar to many footballers when they return after their summer break. But for the players of Sporting Bengal, a London-based team set up in 1996 to push forward Asian football in England, the summer break brings with it a challenge of a different kind. "The majority of my players have been fasting through pre-season," said former West Ham defender Anwar Uddin, manager of Sporting Bengal. "The long days have been such a struggle and so we have not had ideal preparation in terms of the players being able to physically exert themselves every single session. I am not going to ask guys to do that when they have not eaten or drank all day." Sporting Bengal are football pioneers. They are one of few teams in England to consist mostly of Asian players, with 60% of the first-team squad from a minority background. "Throughout my career I played with individuals who have fasted through Ramadan, but it is a bit different when it applies to more than half the squad," added Uddin, who captained West Ham to FA Youth Cup victory in 1999 before spending the majority of his career with Dagenham and Redbridge. "It has been a challenge, but one that we have embraced and what has been really good is the non-Muslims in the squad have really helped out as well." Despite the pre-season difficulties, Sporting Bengal head into this weekend's FA Cup game at Basildon determined to make more history in the competition. In 2005, they were one of the first Asian teams to compete in the FA Cup, but they have never progressed beyond the preliminary round, and that will be the target. The £1,500 prize fund for winning this weekend would be a welcome boost too. "You hear all the cliches but the FA Cup is massive for us," he said. "If we win the game, we can go out and buy some tracksuits. "The fact you are winning prize money means we can do that because everything else we get is community-driven and done by volunteers." It is the ultimate FA Cup journey. Picking a team from the extra preliminary round and following the winners all the way to the final. For John Coyle, that journey began last season at Silsden, a West Yorkshire town that hosted a section of the 2014 Tour de France. "My son works at Silsden and I thought I may as well start there," said Coyle. 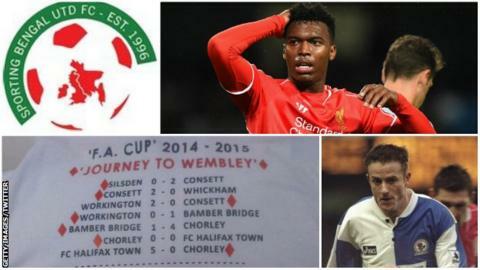 His journey saw him take in 17 games, 10 different grounds and travel 3,300 miles on the road to Wembley. It was not a cheap endeavour as he spent a total of £1,130, with a large chunk of that ensuring he did not fall at the final hurdle. "I could not get a ticket for the final," Coyle added. "I stood for two and a half hours outside the tube station with a big placard saying I needed a ticket and I ended up paying £300 for one that was worth £70." Entrance secured, it was almost the fairytale ending for Coyle. Fate would have it that the ardent Aston Villa fan would get to see his team in the final. That, though, was as good as it got, with Villa losing 4-0 to Arsenal. FA Cup history will be made this weekend as one club make their return after an absence of almost a century. Peterborough Sports are back in the competition for the first time since 1922, having spent the interim years playing at the level below what is required to be able to compete in the FA Cup. The United Counties League Division One side's 93-year gap between FA Cup matches is believed to be the longest in the tournament's history. Colin Day, Peterborough Sports president, has been involved with the club since 1952, and the 77-year-old is relishing the chance to see his side in the FA Cup for the first time in his lifetime. "I'm very excited to be part of it still at my age," he told BBC Radio Cambridgeshire. "We are such a small club at the bottom rung of the ladder of the FA Cup. No matter who gets to the final we can say we were there right at the very start." Peterborough Sports take on Eynesbury Rovers on Saturday, and the FA Cup trophy will begin its long journey to Wembley at the club's Lincoln Road ground the night before.